BIOLOGICAL CONTROL of parasitic ROUNDWORMS with NEMATOPHAGOUS FUNGI on LIVESTOCK: cattle, sheep, goats. Duddingtonia flagrans. BIOLOGICAL CONTROL of parasitic ROUNDWORMS on LIVESTOCK: cattle, sheep, goats. Duddingtonia flagrans, nematophagous fungi.. There are numerous natural enemies of those worms that parasitize livestock. Some of them are indirect enemies because they recycle animal dung, which is the primary breeding medium of the worms. Dung beetles, larvae of many fly species, earthworms and other invertebrates colonize the dung and make it unsuited for worm development, mainly due to accelerated dessication. Other animals (birds, reptiles, rodents, etc.) eat the intermediate hosts of the worms (snails, slugs, ants, crickets, etc). However, none of these natural enemies or competitors is capable of significantly reducing the worm populations in the pastures and cannot be used for biological control. There are several reasons for this. On the one side, most worm species are extremely prolific and produce millions of eggs that ensure that enough will survive in spite of adverse conditions. On the other side, worm eggs and larvae of many species that are eaten by slugs, snails, earthworms, insects, etc. are not digested and destroyed. Instead they survive and even complete development to infective stages inside their "predator", which in fact is not a predator, but an intermediate host. However, not all predators of these intermediate hosts are suitable hosts for the worms they carry. In many cases both the worms and their intermediate hosts (slugs, snails, insects, etc) will be killed and digested by the predator. Click here to learn more about the general biology of parasitic worms. Other natural enemies harm or destroy the worms directly: mainly pathogen organisms such as bacteria, viruses and fungi. So far the most promising candidates for biological control of worms are the so-called nematophagous fungi. They may be useful for the control of gastrointestinal roundworms. 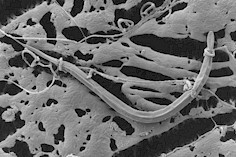 But little is known on the biological control of other parasitic helminths such as tapeworms or flukes. So far there are no commercial biological control methods or products available against parasitic worms of dogs and cats. Click here to learn more about general aspects of biological control of livestock and pet parasites. Besides true biological control methods and other non-chemical control approaches such as vaccines and medicinal plants, there are numerous farm and herd management practices and structural measures that are quite effective for preventing worm problems in livestock. They are summarized in a specific article in this site. "Nematophagous" is a Greek term meaning "worm-eating". Nematophagous fungi live in the soil or in animal excrements. They predate on free-living worm stages (mainly larvae) during certain stages of their life cycle. Some fungi get into the worms as ingested spores that germinate inside the worm's body. The growing fungal mycelium (the body of the fungus) consumes the worm's organs and kills the worms. Other fungi develop their mycelium in the soil or in the dung, but it builds a kind of microscopic net where worm larvae are trapped, colonized and consumed. Whereas most worm control methods with classic anthelmintics target the worm stages inside the host animals (curative or therapeutic approach), biological control of worms with nematophagous fungi aims at controlling the free-living worm stages that contaminate livestock excrements and pastures (preventive or prophylactic approach). The most promising candidate for biological control of parasitic roundworms in livestock is Duddingtonia flagrans, a natural soil fungus. This species has a particular feature that makes it especially useful for use on livestock. Spores fed to livestock (e.g. drenched, or mixed with the feed) are not digested and killed in the gut of livestock, but resist all gastric acids and digestive enzymes and are shed with the feces. Once off the host the spores germinate in the dung and produce a three-dimensional mycelium where the worm larvae get trapped and are consumed. This interrupts the life cycle of the worms and significantly reduces the worm population in the pastures. In the last decades numerous field trials have contributed to better understanding the factors that affect the anthelmintic efficacy of such spores fed to livestock (cattle, sheep, goats, pigs) and their environmental impact. These studies indicate that the massive presence of Duddingtonia spores in the feces is not detrimental for the natural decomposition of the feces. Beneficial insects feeding or breeding on livestock dung (e.g. dung beetles, fly larvae) are not negatively affected by the presence of Duddingtonia spores or mycelia. And no detrimental effect on other soil-dwelling worms that are not parasitic for livestock was observed. Regarding the efficacy against parasitic roundworms (e.g. Haemonchus spp, Teladorsagia spp, Trichostrongylus spp) these trials have found out that it is crucial that Duddingtonia spores fed to livestock reach the feces together with the worms' eggs. Otherwise development of the fungal mycelium will be weaker and anthelmintic efficacy insufficient. Unfortunately this is not always easy to achieve, because shedding of egg worms can be intermittent. In most cases it won't be possible for farmers to predict when to administer the fungal spores to ensure that they are shed together with the worm's eggs. In those field trials, results regarding the anthelmintic efficacy (determined as weight gains in treated groups compared with weight gains in untreated groups) have been inconsistent so far, both in cattle and sheep. In some cases increased weight-gains were noted after treatment with fungal spores, but not higher than after improving the grazing system. In other cases worm populations in pastures were reduced, but infection rates of the animals did not diminish significantly. Varying climatic conditions are also a critical factor because germination of the spores and development of the mycelia in the dung depend on climatic conditions (temperature, humidity, etc.) and are significantly inhibited by cold and dry weather. It must be mentioned that administration of Duddingtonia spores to infected livestock has no direct anthelmintic effect whatsoever on the treated animals. If these animals are heavily infected they may require treatment with classis anthelmintics. The effect of fungal spores delivered to livestock is an indirect one on the worm population in the pastures. If this population is reduced, infection rates of livestock grazing there in the future will decline and harm will be reduced. Research results are promising, but in most countries there are still no commercial products for livestock based on Duddingtonia spores.